WineGirl Wines came to my attention recently as a perfect fit in my Seattle Urban Wineries series. Angela Jacobs is the "Wine Girl" behind WineGirl Wines. Making wine since 2001, she fell in love with wine while working at Cucina Cucina and made her first release (a Pinot Noir) before she turned 21. Angela agreed to meet me for lunch at Guancos Tacos, a delicious pupusería in Seattle's University District. We had an excellent conversation over lunch, touching on social media and wine and the role it plays before we turned to WineGirl Wines. Angela describes her operation as a "nano-winery" because of its small size - annually, WineGirl Wines produces 200 cases a year. She told me that she owes a lot to Derek DesVoigne at Cuillin Hills. Given her small size she needs to be very efficient and effective in selling her wine so that she'll have the capital necessary to make the next vintage. Angela is still working it out. But she's also got long term plans for WineGirl Wines, including a vineyard plot she just acquired in Lake Chelan. She's also toying with the idea of opening a tasting room in the next year, though she still hasn't nailed down a location. For the time being, her wine making operation is based in Sammamish, WA, and sells her wine out of her Ballard home. Of the 200 cases produced annually, the largest single production is the Kamari Black Label Reserve ($33), a Walla Walla Valley blend of which she made 48 cases. Angela makes three labels right now: the Firá, the Derby Wife, and the Kamari. Her Firá wines are named after the Greek word for fire and are her most affordable wines. These excellent wines go fast, and only the Chardonnay is still available. 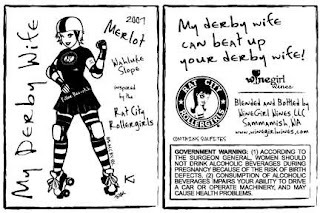 She also makes a My Derby Wife Merlot ($27) from Wahluke Slope in homage to the Rat City Roller Girls roller derby club, of which Angela is herself a member. The third label is her high-end wine: Kamari, named after the black sand beaches of Greece and made from sustainably grown grapes from Zerba Cellars in Walla Walla. The Kamari wines, represented by a beautiful black label, include a Malbec ($29), the Black Label Reserve ($33) and a Cabernet Franc ($26). As of this writing, there are fewer than two cases remaining of the Malbec and Cab Franc. Angela was kind enough to bring me a bottle of the Kamari Black Label Reserve to sample. It is a decadent blend of four Bordeaux varietals - 50% Cabernet Sauvignon, 18% Merlot, 17% Malbec, and 15% Cabernet Franc, and has a beautiful dark ruby color. The twenty months it spent in oak are evident in toasty vanilla notes on the nose. The palette shows black cherry and chocolate in an unbelievably smooth and well-structured wine. One reviewer in the online store described the Black Label Reserve as "the perfect combination between boldness and quiet charm," an apt description that I think fits this well-crafted wine very well. This wine is the very definition of boutique wine-making done right. Angela's wines can be purchased online as well as at various Seattle area retailers. Having had the Black Label Reserve, I can tell you that I'll be looking to pick up more of Angela's wines, and I recommend you do the same. Could agree more! Fira and Kamari are one of Seattle's best kept secrets! Rock on, WineGirl!